Sally Moore’s new book, Four Joy – An Alzheimer's Caregiver's Journal & 52-week Devotional, ($10.99, paperback, 9781498472128) shares the author’s daily struggle of taking care of her husband, Herman, throughout his struggle with Alzheimer’s. This book reflects Sally’s religious faith, family values, experience and insights to help other caregivers cope with the daily challenges in caring for their Alzheimer’s loved ones. She includes 52 weekly Biblical inspirations that were her personal dialogue with the Lord. Sally believes that Alzheimer’s caregivers are invisible to their loved ones, isolated from friends and ignored by society. Her book validates caregivers; it provides strength, peace and memories. The way Sally explains their journey was that she entered her husband’s world and never looked back. They both knew how the story would end as they had already witnessed her mom’s progression with the same disease. Herman and Sally lived each day as if it would be their last together. They had a blast and subsequently fell in love all over again. Faith and love sustained them throughout the journey – a journey that ended sooner than expected. Sally Moore was 52 when she returned to college; five years later she earned a Master Degree in Social Work. She is a Licensed Clinical Social Worker and a retired Hospice Social Worker. Sally is the Founder and Executive Director of Perks n Moore, a non-profit organization that is dedicated to taking care of all caregivers. By providing mentoring, education, support and socialization programs, caregivers are able to meet the ever-growing demands and challenges of caregiving. Sally’s religious faith, family values, experience and insights provide an Anchor of Hope to those caring for their loved ones. Xulon Press, a division of Salem Media Group, is the world’s largest Christian self-publisher, with more than 15,000 titles published to date. 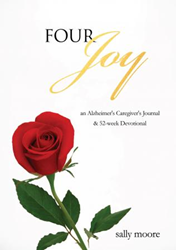 Retailers may order Four Joy – An Alzheimer's Caregiver's Journal & 52-week Devotional through Ingram Book Company and/or Spring Arbor Book Distributors. The book is available online through xulonpress.com/bookstore, amazon.com, and barnesandnoble.com.